7.85-Inch iPad Mockup - Will You Buy One? Ever since Apple launched the iPad in 2010, there have been rumors that Apple will launch a smaller and cheaper version of their tablet - unofficially dubbed iPad mini. Steve Jobs had famously taken a dig at Apple's competitors for launching tablets that sport a 7-inch screen. Steve Jobs had this to say at a conference call last year about upcoming tablets from competitors. No thanks. I'm waiting for this head tracking, (glasses free) iPad3D that's coming out. The full size one! Using the toilet paper app that is! Yet another day, yet another rumour. I will buy two, one for me the other for my daughter. I will give my grandson my iPad1. I also have the kindle Fire and I love it for its size. But the Apple quality does not come with the Kindle so hurry up and make the 7.8 inch pad. No, I'm happy with the current size and I don't want my iPad to be smaller! OMG! Oh Apple,Please stop finding ways to take my money. Every time I turn around you have released yet another wonderful product. Your truely genius in finding new ways to force me to spend my money on some new toy. I have bought everything from a MacBook Air (13") to the iPod touch. iPhone 2~4siPad 1~2iTouch 1~4MacBook AiriPod OriginalWell I guess not everything, but pretty darn tootin close! To answer the question from the article, yes, 100%! I would even wait in line on release day. What can I say I love all things i!This would fit nicely between my iPad and my iTouchy feely!This is just like an iPod Touch getting it on With an iPad 2! I cannot wait to buy their offspring! Please release it soon. All the apple lemmings will buy they can't help themselves. Then they will swear up and down how revolutionary it is and apple is GOD steve jobs is taking over heaven and will start heaven 2.0 ! Wow. The release of a 7 inch tablet would make Apple hypocrites, would it, consider they bashed all other maker of 7 inch tablets as too small? But I sure no one will remember that and they'll go buy it in droves. 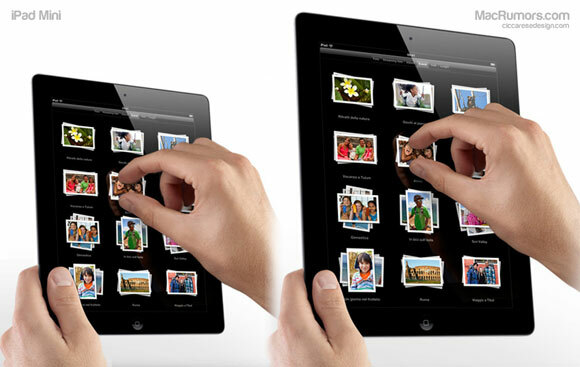 Can new ipad mini replace condom? OK has Apple got Steve Rolling in the grave?? I would definitely get the smaller 8" iPad... Many folks want something a bit smaller to fit better in a briefcase or ladies purse... It's a good reaction by Apple to react to competition... Recall Apple has three screen sizes for the MacBooks, why not multiple sizes for iPads, makes lots sense to me... And it's easy to do.. Look at the insides of the iPad 2... Lots of internal room for trimming the case and screen size with little or no modification to the electronics or the battery... Looks to me like there is almost 1" of empty space all around the internals, like Apple was planned for this possibility many years ago in their design... Jw.